How many classes are there in a semester? There are ten classes per semester, for forty-five minutes each week. Each semester we have a different Song Collection (families receive 2 CD's, digital downloads for each semester, access to their music on the free Hello Everybody app and a songbook), so there is lots of material to choose from. 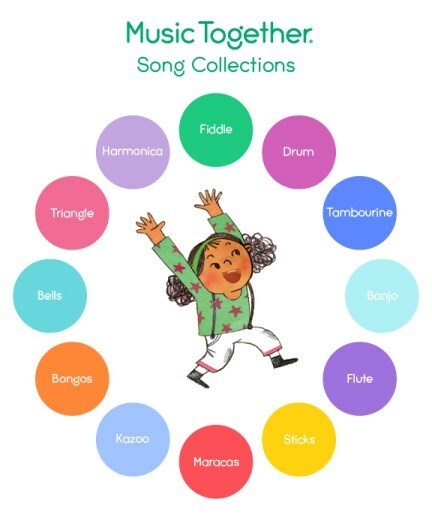 During the ten week session, songs will be covered several times over the semester in order to develop concepts presented in previous weeks and so families can experience the songs in different ways (with instruments, as large movement activities, as part-songs or rounds, etc.) but no two classes will be the same. There is a ritual order of activities - children in this age-group need the routine of knowing what to expect (children love to anticipate the snuggle of the lullabye right before the "goodbye" song each week). How many different song collections are there? Will I learn different songs each semester? There are NINE different song collections (so 3 years worth!) of unique curriculum, as well as our compilation "best of" summer semesters. It never gets boring! If the song collection is called, say, "Bongos", does that mean we will play Bongo drums each week? Or if the collection is "Fiddle", do I have to purchase my own instrument? Each of the song collections is named after an instrument to distinguish it from the rest of the song collections. While we may not play the instrument itself, it will be featured in the recording, so you will certainly hear it!. The instrument is also featured in all the artwork on the CD's and in the songbook. Parents are also always welcome to bring their instruments to play in class! We use a variety of non-pitched instruments (drums, shakers, bells, sticks etc.) and pitched (resonator bells) that are age appropriate for adults and children alike. In addition we have expressive movement props such as scarves, canopies and a "cooperaband" to add to our music play! Many teachers will play guitar, ukulele or autoharp, and parents and caregivers are welcome to bring their own instruments upon occasion to add to the mix! We don't expect children to sit still! Children are welcome to learn in whatever style suits them best. For some, that means sitting and observing; for others, that means walking around; for others, that means doing what the grown-ups are doing. All of these styles are accepted and welcomed and we often find that even if a child appears to be doing something completely different in class (such as stacking instruments or staring out the window! ), they will often go home and re-enact activities that were experienced in class. Children at this critical stage of development are learning ALL THE TIME, whether they appear to us to be doing so or not! Only unsafe behaviours (running or full-body contact) will be discouraged. The most important thing is that parents and caregivers come prepared to have a wonderful time themselves and be ready to fully participate and model their own enjoyment of playing with music. Prompt arrival will also ensure your child enjoys the entire class, from "Hello Everybody" to "Goodbye, So Long, Farewell!" What do we do in the classes? Forty-five minutes will zoom by before you know it. Each class consists of a carefully planned sequence of songs and chants - we dance, play with instruments, sing, explore tonal and rhythmic patterns, and ALWAYS include the highly anticipated instrument jam ("Play Along"). The lullaby brings things to a lovely closure each week, with the lights down low and parents nursing and/or snuggling their children as we all sing quietly together. How can I preview a class with my child? We periodically offer free demo classes (see the "classes page" for details). If there is no demo class available, please contact us in order to arrange a time to join one of our regularly scheduled classes. This visit must be scheduled - spontaneous drop-ins are not permitted. Can I bring extra children? PLEASE NOTE - No drop-ins are permitted. Only registered children and their siblings under 9 months may attend class except by special arrangement. Music Together® licensing sets a limit on the number of children per class. Older siblings may upon occasion attend on school holidays (space permitting) - see below. Throughout the semester, Music Together classes may be in session when older children have a school holiday. Older siblings of registered students may occasionally visit provided the older sibling is HEALTHY and that the visit is prearranged with the office or the teacher (2 visits max per term). Visitation spots are limited to two per class and are available on a first come, first serve basis. These spots must be booked through our office, musictogethervictoria@shaw.ca. • Let older sibs know they are welcome in the class and we are looking forward to making music with them in the circle. From past experience we have found that it doesn't work very well when older children read, colour or play with toys on the side while we are all making music in the circle. Little kids LOVE to know what big kids are doing! I have a child I provide daycare for - can I register him or her as a sibling to my own child? Only actual siblings can be registered at the "sibling" rate - we feel it is important for all every child's family to have access to all the resources and materials that come with the program. This allows families to be an active part of their child/ren's musical development journey even if they are seldom able to attend class themselves. Can I bring adult visitors? Grandparents and other special grown-ups in your child's life are always welcome. Please be sure to arrive five to ten minutes ahead of class start so these special guests can get meet the instructor and get a comfy spot. I really want to bring my friend and her child to try out a class - I know she'll love it - is that OK? There are sometimes free demo classes prior to the start of the regular schedule, and you can always invite your friend to class - please just make sure you get him/her to contact Music Together Victoria directly to make sure there is an available space - we cannot accommodate drop-ins. Music Together is designed for children from birth through five (and their adults!!!). There are several reasons to have a mixed-age class: researchers have found that a mixed-age group tends to foster a more natural, family style learning environment. Older children learn from being in a leadership role, younger children benefit from the example of an older child. Siblings can attend class together, making it easier for parents to enjoy a true family experience. Of great importance to note is that children of the same age are not necessarily at the same point in their musical development, so separating them by age does not necessarily create a better learning environment during these early years as we now know - hence Music Together's more natural mixed-age model. Our musical play activities are parent-child oriented rather than child-child oriented - emphasis is on the powerful connection between parent or caregiver and child rather than social interactions between the children. You are your child's most important role model no matter what kind of singing voice or dancing feet you have (or think you have!!). It is less important how well you sing than it is to model making the choice to sing. By your example, children will learn that music is a natural, enjoyable and important part of their lives. You, the primary caregiver, are the only one who can give your child the gift of a positive disposition for making music. No CD can impart that! What your child loves and needs most is to hear your voice. Reading the Parent Guide (you will receive this the first time you register for a class) will also give you more information about how to provide developmental support as you musically interact with your child. How can I find out more about Music Together? We care about the health of all our participants, and our own health too! If you or your child are ill or have any communicable condition, please do NOT come to class - while we'll miss you, we think it better if you stay home and recuperate fully. Please see our Health and Wellness page for more details. Please do NOT bring unregistered siblings who are missing school due to illness to Music Together class with a younger sibling.